Sonic Heroes was one of several games included in a promotional bonus disc that was given to customers who pre-ordered Mario Kart: Double Dash!! for the Nintendo GameCube. The disc contained playable demos for: Mario Party 5, F-Zero GX, Teenage Mutant Ninja Turtles, Star Wars Rogue Squadron III: Rebel Strike, and of course Sonic Heroes. Also on the disc were videos of 1080° Avalanche, Kirby Air Ride, Pokémon Colosseum, Final Fantasy Crystal Chronicles, Harry Potter: Quidditch World Cup, NBA Live 2004, and SpongeBob SquarePants: Battle for Bikini Bottom. There was also Game Link transferrable exclusive content for Fire Emblem on Game Boy Advance included. 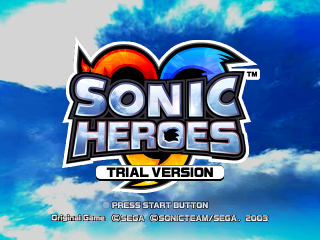 The Sonic Heroes demo has just two playable teams (Team Sonic and Team Dark) and two levels available: Seaside Hill (Team Sonic) and Bullet Station (Team Dark). There are a few differences between the Sonic Heroes demo and final; they are mostly related to different sounds and voices (Omega's voice not being filtered yet), and the object placement being rearranged. The font was also slightly similar to the PS2 and Xbox releases but slightly less wide. The blue box for subtitles from the previous builds was removed from the interface. This page was last edited on 11 September 2018, at 00:58.